When I saw it coming towards me I thought it was a 66 on parcels, which would be rare enough. But no it was 66156 hauling a failed D9016 on the 1Z73 Colchester - Holyhead charter! 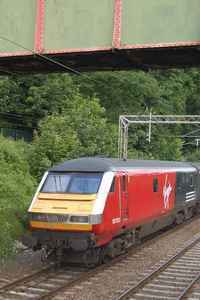 So in 2 1/2 hours plenty to see, not as much freight as I would have liked but plenty of class 86 and 87 action which will soon be a thing of the past as Virgin Trains introduces its new Pendolino fleet. 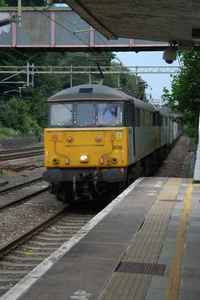 87012 powers north with an earyl morning Virgin Trains Service through Apsley.